Shakespeare refers to it in ‘Twelfth Night’, first performed in 1602. Sir Toby Belch to Sir Andrew Aguecheek …. “as many lies as will lie in thy sheet of paper, although the sheet were big enough for the bed of Ware”…. ‘Northwood Ho’ a play by Thomas Dekker & John Webster, first performed in 1605 contains numerous references to the town as well as Wadesmill & Puckeridge. The two themes are cuckolding, food and good cheer, a complicated plot ends happily with “This night let’s banquet freely, come, we’ll dare our wives to combat in th’ great bed in Ware. In 1776 an American ‘loyalist’, Samuel Curwen, saw it and described it in detail including all the defacing with paint and penknife. Byron’s ‘Don Juan’ published in 1821 also makes reference to the “Bed of Ware”. Further literary allusions of the 19th century to the Great Bed were – a satire about Napoleon in 1805; Nare’s Glossary 1822; ‘Pictorial Shakespeare’ by Charles Knight (1839); a letter from Thomas Carlyle to his wife in 1844 and ‘The Virginians’ by William Makepeace Thackeray. (1858). The Bed also featured in guide books and books about furniture. Newspapers used it as a metaphor for absurd extravagance – the large canopied pew used for the Bishop of Bristol’s enthronement in 1856 was compared to the Great Bed. Literary references continued. In 1857 Benjamin Webster mentions it in a one-act play ‘Boots in the Holly Tree Inn’ – “Why Norah this sofa’s as large as the Great Bed of Ware. In 1906 Thomas Hood included it in an ode. In 1932 an American novelist, Djune Barnes, also refers to it in ‘Nightwood’. In 2001 The Victoria & Albert Museum unveiled its new British Galleries in which the Great Bed of Ware, now refurbished, was give due prominence and the Poet Laureate, Andrew Motion, wrote a poem about it. Ben Johnson’s play “Epicoene or The Silent Woman”, performed in 1609, also refers to the Bed and the lack of cleanliness in Ware. 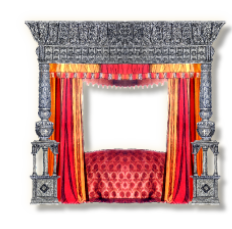 In 1610, Duke Ludwig Friedrich of Wüttemburg stayed in Ware and slept in a bed “eight feet wide”. Richard Brome ‘s ‘The Sparagus Garden’, a comedy performed in 1635 which was one of a series of plays set in actual locations, also mentions the Great Bed. After the Civil War and the Restoration of the Monarchy in 1660 references to the Bed’s size are found in ‘The Projectors’ by John Wilson (1665) and ‘The Recruiting Officer’ George Farquhar (1706), This also gives the name of the Crown Inn to which the Bed had recently been moved. A journal by Ned Ward, a London Innkeeper, which he called ‘The London Spy’, issued in 18 monthly parts between 1698 and 1700, included reference to the George Inn and the Great Bed. A novel by Mary Davys ‘The Reformed Coquet’ (1724); a letter from Lady Luxborough (1749) and an article in The London Chronicle (1765) all refer to the Great Bed.